It’s OK to Keep it Simple! One of the most stressful aspects of raising my twin boys over the last two years has always been the battle that occurs when it’s time to feed them. 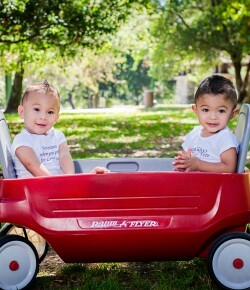 We are currently in the toddler stage, (my twins Noah and Nikoh are turning 2 on March 26!) so the time frame I have to get them to eat ranges from 4-7 minutes (per meal) on a good day. After that, they are “over it.” My boys are pretty good eaters, but sometimes it takes me having to whip up 2-3 small meals before they will actually eat something (And who really has that kind of time right? !….Definitely not this twin mama!) Often times I end up with pieces of food in my hair and on my clothes because they rather “play” than eat! So on those trying, tiring, stressful days, I remind myself, “It’s OK, to keep it simple!” It can’t always be french toast topped with quinoa and bananas, an egg omelette with veggies and ground turkey, or a breakfast quesadilla…you catch my drift, right? Sometimes it’s ok to just make sure your toddler eats something decent, maintain your sanity and keep it super simple! So I wanted to share two of the easy peasy snacks that have really helped me keep my stress level down on the days when my twins were not in the mood to eat, and all I wanted to do was crawl into a dark hole. Noah & Nikoh’s current favorite snack is what at home we call a “liquiado,” or in English, a shake. The one pictured above is my “Breakfast Blend” liquiado. Super delicious and packed with nutrients so it’s a win! win! Plus it takes all of 3-4 minutes to make and voilà!…my baby boys have a delicious meal they can drink on their own, and I have a few minutes to decompress! Here’s what to do: In a blender I add the following – approximately 4 cups of organic whole milk, 1 banana, two cups total of fresh strawberries, raspberries, and/or blueberries, one cup of oatmeal, half a cup of steamed quinoa and a dash of Nestle’s chocolate milk powder. Blend and serve! It’s really that simple. This next snack is super easy, traditional and loved by most parents! Peanut Butter & Jelly sandwiches…yum! Since my boys are toddlers their food has to be cut into small pieces for obvious safety reasons so PB & J’s are great! I originally gravitated towards the Smuckers Uncrustable Sandwiches which you can find at the grocery store, but that got expensive real quick! (One box can carry 15 sandwiches and costs approximately $10.) So instead I found this awesome Cut-N-Seal gadget (pictured below) from Pampered Chef, which costs less than $20 and is much more economical! Now I make my twins homemade PB & J Uncrustable Sandwiches multiple times a week, for much less than buying them from the store. You can see how easy it is in a few simple steps (pictured below) . Now yes, I realize I am not reinventing the wheel here, and these snacks aren’t unique, but they have come in very handy for me… So I just thought I’d blog about them to remind moms/parents there are a few easy things that can be a big help on those hard days. So give yourself a break 😉 And keep up the great work!